(Aram Boghosian for The Boston Globe ) Pork belly banh-mi by chef Tony Maws of Craigie on Main. A parade of piggy balloons line the walls in the over-crowded ballroom. Guests stare as they watch butcher Joel Cox expertly removing the jowls of a whole hog. In an age when even butchers have groupies, a pig-butchering demonstration can draw a huge crowd. Around the perimeter of the room, more guests jostle each other to grab samples of red-braised pork belly, skewers of crispy head and tail fritters, and pig-shaped bacon-flavored marshmallows. Last week, the Liberty Hotel played host to Cochon555, a competition in which five chefs go snout-to-snout, each hoping to win the Prince of Porc award. Organized by Taste Network to raise awareness for Farms for City Kids, a dairy farm in Reading, Vt., that offers free educational programs for inner-city schools, Cochon555 underscores a nose-to-tail trend sweeping American bistros and gastropubs. Endangered Hog Foundation was on hand to help educate the public. Boston is the sixth stop in a 10-city tour. Participating chefs are Jason Bond of Beacon Hill Bistro, Joseph Margate of Clink (the restaurant is located in the Liberty), Jamie Bissonnette of Toro, Tony Maws of Craigie on Main, and Matthew Jennings of Farmstead Inc. in Rhode Island. The 300 guests each paid $125 to taste everything the chefs offered. The week before the event, each chef was supplied a different heritage breed hog; the idea is to produce their proudest porcine pleasures. A panel of 20 local chefs and food personalities preside over a tasting and vote on the prince. Heritage hogs, some of which were raised centuries ago, started to disappear in the last century in favor of several breeds that can survive factory farm conditions. The heritage breeds are starting to get more attention from chefs and farmers. They have genetically distinct lineages, with flavors and textures far more interesting than the lean pork available today in most markets. Bond was sent a Berkshire pig. This heavily marbled meat has become a darling on menus, often labeled as Kurobuta. The chef's spread includes a macabre presentation of pig parts: mortadella-stuffed trotters, brains in aspic, lardcrackers with pork blood jelly, and a "Frankenpig" centerpiece he fashioned by wrapping a ham terrine with the face and tail of the pig. Based on fan-fascination, Bond looks to be an early favorite. In stark contrast is dark horse Jennings and his Rhode Island team. His whole hog carnitas are inspired by a recipe from a Mexican prep cook in his kitchen. They're made from the shredded shank, belly, and shoulder of a Red Wattle (a breed with distinctly dark, beef-like meat). Fresh corn tortillas are messily piled with juicy shredded pork and topped with the Mexican white cheese queso fresco and pickled onions. Jennings hopes the simplicity of the dish will work in his favor. Next to him, Bissonnette serves Yorkshire hog banh-mi. These popular Vietnamese sandwiches, which have become all the rage in the last few years, are filled with five varieties of housemade cold cuts and crunchy pickled vegetables. Well known for his skills as a charcutier, Bissonnette is assembling diminutive sandwiches. They are an easy hit for those who got to taste them. But having to simultaneously plate for 20 judges seated upstairs and feed guests at the same time slows down production and costs him valuable points from impatient guests. Maws began the competition with his own challenge: "We'll just have to get in the ring with our sausages and see who makes it out." To that end, he produces French-inflected banh-mi that are less successful than Bissonnette's. 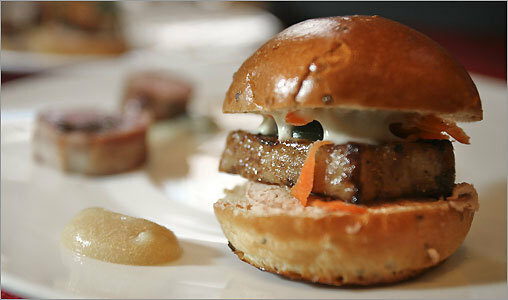 Brioche buns overwhelm the pork belly of the Yorkshire-Duroc breed. But a stunning preparation of crisp-skinned confit served with quince puree and a boudin noir-stuffed pork loin wrapped in housemade bacon makes up for the misstep. At the judge's table, Tim Cushman, chef and owner of O Ya in Boston, declares Maws's fried pork bones coated with sweet nuoc cham the single best bite of the evening. Despite having home-field advantage, Margate of Clink has the weakest showing. He's serving pork consomme with pork fritters and aromatic porchetta sandwiches, both well received, but he fails to use the whole pig to his advantage. As judge Barbara Lynch of Barbara Lynch Gruppo puts it, "He got the Tamworth - that's the best bacon hog you can get - and all we got was soup and a sandwich?" Many judges are impressed by the prowess displayed by Maws and Bond (each produces more than half a dozen distinct and complex creations); nevertheless, others feel they stretched themselves too thin. Lynch, Bond's former mentor, has a look of motherly concern. "I know Jason. His liver mousse and mortadella can't be touched. Something was just a little off today." In the end, Jennings's simplicity and focus on flavor does indeed prevail. Following the carnitas tacos, which he pairs with homemade tepache, a fermented pineapple drink made in Mexican prisons (appropriate in the Liberty Hotel's former jail surroundings), Jennings delivers a palate cleanser of buttermilk and lard sorbet, followed by braised belly with a simple glaze of honey and thyme over crispy fried strips of ear, then a chocolate torte thickened with pig's blood, topped with cream subtly flavored with whipped pig's brain (both more delicious than they sound). As Jennings, the Rhode Island chef, accepts the Prince of Porc trophy with one hand, and with a strip of chocolate-covered bacon in the other, he tells the assembled crowd, "It's an honor to cook with these guys in their hometown." His initial plans were not the least bit simple, he says. "We started out with all kinds of crazy ideas using liquid nitrogen and meat glues. Then we decided to just strip it down and go with what we know is delicious. I guess it worked."